Dr Marianne Ellis, Senior Lecturer in Biochemical Engineering is the UK's leading expert on cultured meat. If this process can be reproduced on an industrial scale, meat eaters could soon be enjoying a slaughter-free supply of meat products. The current texture of cultured meat makes it best suited to sausages and burgers. However, it is hoped that products such as steak and bacon rashers will be developed in the future. Led by Dr Marianne Ellis, Senior Lecturer in Biochemical Engineering in the University’s Department of Chemical Engineering, the multidisciplinary team with expertise in biochemical engineering (Mr Scott Allan, New Harvest Fellow; Mr Moein Mirfakhar), plus biology (Dr Ruth Wonfor and Nicholas Shorten, Aberystwyth University) and biomaterials (Dr Paul De Bank, Travis Callue, Department of Pharmacy & Pharmacology; Dr Janet Scott, Department of Chemistry, University of Bath) is focussing on the effective scale-up of cultured meat. Lab-grown meat products are not on sale yet in the UK however, a number of companies in the US have created edible products including a burger, and meat balls. The UK really is one of the key essential players globally on the scale-up so that is what we're working on as engineers, developing systems to grow the cells on a large scale. In terms of when we're likely to see it in the supermarkets, probably the most advanced company at the moment is Mosa Meat and they are predicting four to five years. Currently, it is very expensive and energy intensive to develop cultured meat and the team at Bath is working on reducing the costs and energy required with the aim for cultured meat to be the same price as traditional meats in supermarkets. The researchers believe there are a number of advantages of lab-grown meat, namely helping address the world’s future food needs as well as reducing greenhouse gas emissions as part of efforts to tackle global warming. The huge advantage of eating something like cultured meat is that it addresses our global needs and our global challenges of both food security and addressing climate change. Our global population is growing and our current food production methods will not scale to produce what we need to feed everybody. We need something like an additional 60 million tonnes of protein to feed the population by 2050 and we can't do that like we currently do. This cultured meat is a way to do that. It can be done anywhere in the world – it can be done where it is really hot and where it is really cold. We have the opportunity also to address our climate issues because this method compared to traditional beef production has much less greenhouse gas emissions, has much less water use, has much less land use and reduced energy use so it really addresses those two key global challenges. 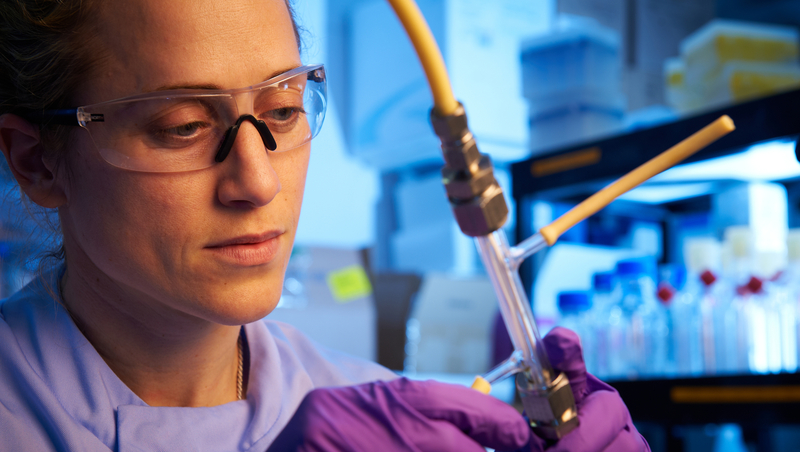 Dr Ellis’ work is currently funded by New Harvest, the University of Bath and the EPSRC but additional funding would enable Dr Ellis and her team to speed up their research and significantly enhance the UK’s position in the global race for cultured meat. Growing bacon in the laboratory from University of Bath on Vimeo.